A lie detector test pointed the finger of guilt at the husband of a pretty 18-year old city woman whose body was found along Beaver Creek in the autumn of 1961. Nancy Lee Chandler Boyd was beaten and shot to death along the lonely creek road in the early hours of Nov. 5, her corpse not found for ten days. 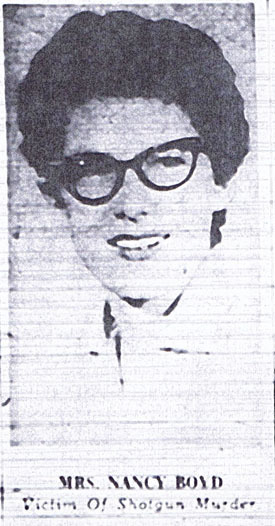 Picture from Microfilm reproduction of the East Liverpool Review, November 16, 1961. She had been beaten, killed with a shotgun blast to the head and left downhill from the lane, clad in pedal pushers and a leather jacket. City police received a telephone call Nov. 15 from a "Roger Smith," possibly a hunter, who reported finding a body and saying he would meet officers at the site. He never showed up. Her estranged husband. William Boyd Jr., 23, of 1940 Pennsylvania Ave. Ext. was among the suspects questioned by Sheriff Russell VanFossen and city police. Boyd, who been a ware boy at the Hall China Co. and parttime laborer, had been separated from his wife since August. She and their 11-month old daughter resided on Dresden Ave. with her parents, Mr. and Mrs. Frank Chandler. Investigation revealed a pattern of quarrels and tension between the husband and wife over care of the baby and her being seen with various other men. Boyd was born in Wellsville, lived with his grandparents then his father after his parents obtained a divorce in 1946. He quit school in eighth grade to work for a pony ride in a circus which passed through town. When the circus broke up in Florida, he held odd jobs in California, Cleveland, and elsewhere, including the Homer Laughlin China Co. and a local service station. He met Nancy Lee at Lake Marwin where he had gone swimming. They began seeing each other, and she became pregnant so he married her in 1960. The pair were residing in a small house near her parents on Dresden Ave. when their strained relationship brought a breakup Aug. 10, she going to the Chandlers, he to his father's home where a younger brother, Frank, also stayed. The baby had been taken under custody of Juvenile Court, and placed with Mr. and Mrs. Walter Ferrebee of Harvey Ave.
Sheriff VanFossan quizzed Boyd closely about the killing, and he agreed to take a lie detector test. 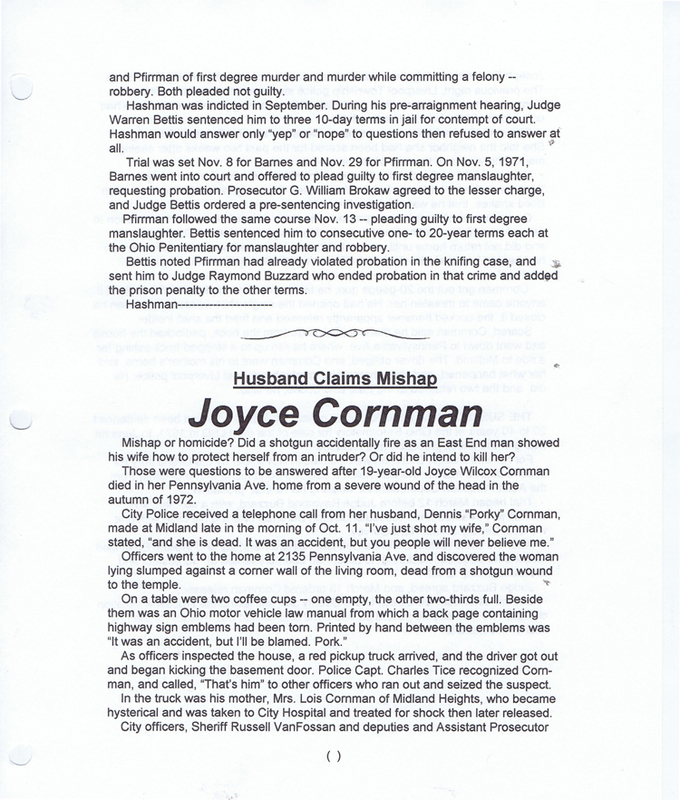 Two agents were brought from the Ohio Bureau of Criminal Investigation with polygraph equipment, and administered tests to Boyd and two other suspects. 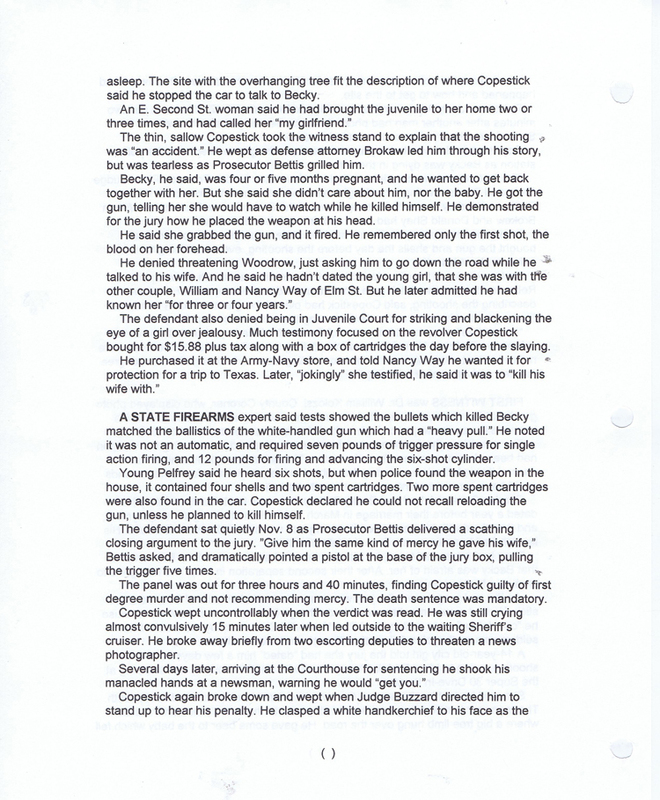 After the lengthy testing Nov. 21 at the County Jail and intensive grilling by VanFossan late afternoon and that night, Boyd admitted the murder, and signed a 26-page confession. 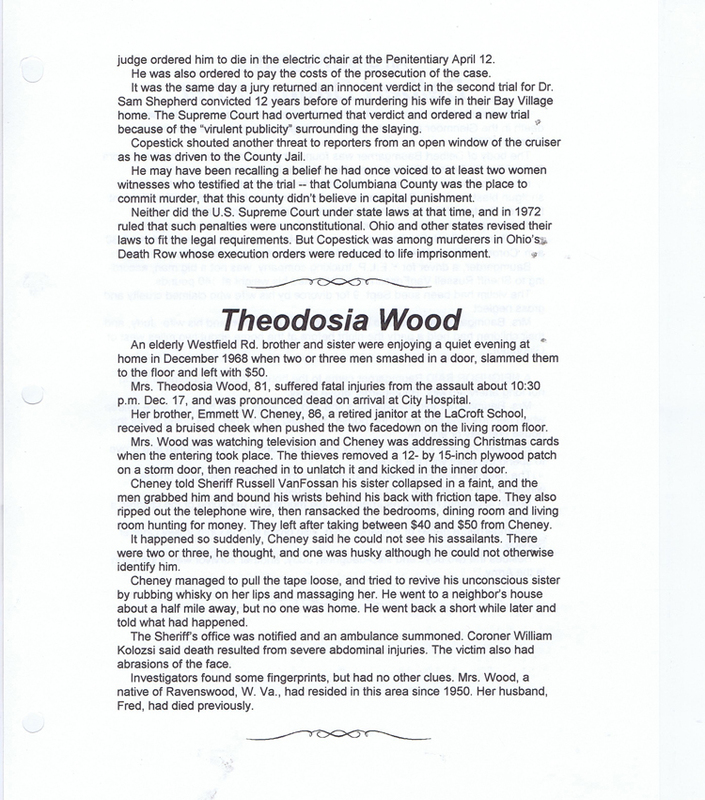 His statement and subsequent trial testimony revealed the stormy marriage and its bloody end in darkness along the creek. Boyd had been at a farewell party irkthe East End honoring a friend leaving for the service. There was considerable drinking. The group later went to Higgs Inn where Boyd saw Nancy Lee at the bar. They spoke, according to witnesses, she saying, "Hello there, Mr. Boyd," he answering "What d'ya say." Later, Boyd recounted, he didn't accompany the group to Hoge's restaurant but drove out by the restaurant, and later stopped at a billboard near the Chandler house. He saw Nancy Lee park her car, so he drove over and picked her up and began to drive around, "just talking." It was about 3:30 a.m. They traveled to the Beaver Creek road to finish some beer he had in the car. It was here he discovered a flat tire, and started to change the wheel. As he worked, they began talking, about different things, including the baby and her intention to have her aunt adopt their 11-month-old daughter. "YOU'LL NOT ADOPT that baby to anyone," he testified, "that baby is mine!" He said she then shouted it wasn't his, "and that's when I threw the jack handle . . . I lost control of myself." Earlier he had told officers she was getting a can of beer from the car while he was replacing the wheel, and he commented that his hands were soiled from the work. "She laughed . . . and that was when I threw the tire tool." He claimed he didn't remember hitting her again, but when he sat her up, there was a lot of blood on her. Unable to find a pulse, he dragged her over the hillside -"I was scared" -- and picked up the beer cans, tossing them in the rear of the car. He saw his 12-gauge shotgun on the back floor. Loading it, he went down to where she was lying. He fired it at her head. Boyd said he returned home, changed clothes and burned the bloodied garments along with Nancy's purse. That evening he went back along the creek road throwing away articles he had found in the purse. 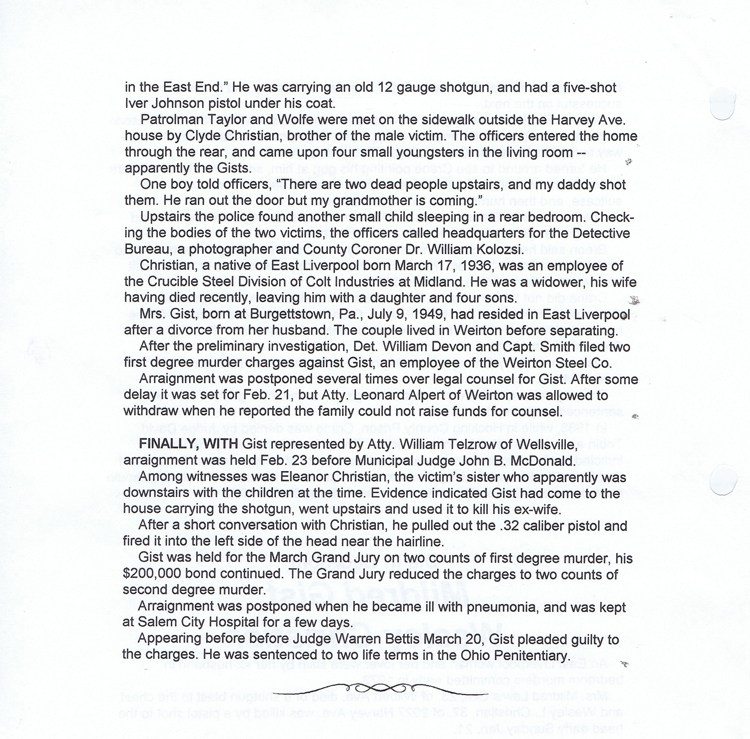 As part of the Prosecution's case in the March 1962 trial, an aunt of the victim who lived near the Boyds described an incident in the home. She said she heard screaming and ran over to find Boyd holding his wife down, pounding her head on the floor. 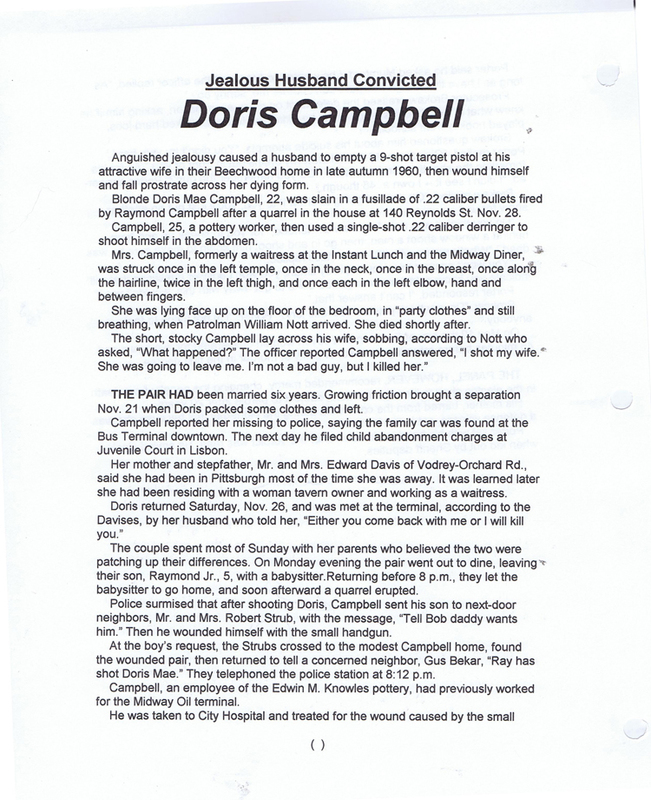 Nancy's mother, Mrs. Chandler told of seeing Boyd on the street talking to Raymond Campbell, then under indictment for shooting his wife to death in their Beechwood home in 1960. 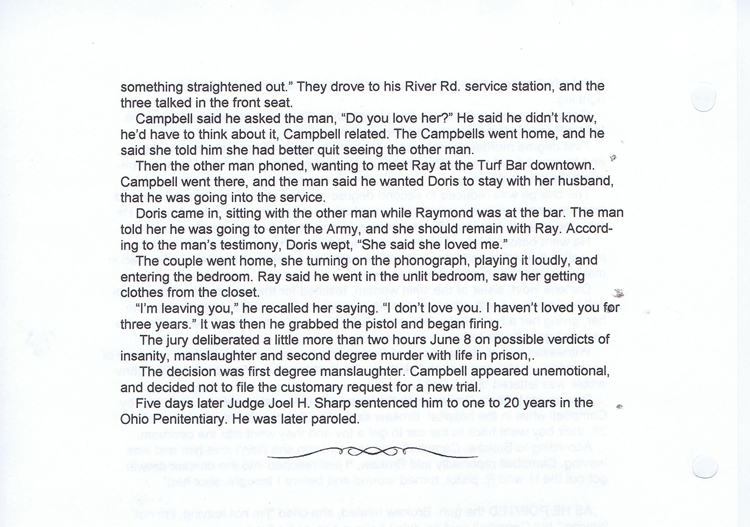 Mrs. Chandler said Boyd later told Nancy Lee he "would do the same" with her if he caught her with another man. "I don't know why I shot her. She was dead," Boyd said during the preliminary hearing in Municipal Court where he pleaded not guilty to first degree murder. A Harvey Ave. friend of the Boyds testified he had been intimate with Nancy Lee when the husband was working in Cleveland. He had discussed this with Boyd one time they were fishing at Grimms Bridge, and Boyd, he said, "didn't seem to care." Franklin, the younger Boyd, testified he had seen Nancy Lee with a man he didn't know downtown at the Roma Cafe the night before the shooting. He said his brother had awakened him the next morning and told him he had killed somebody. Later he told Frank it was Nancy Lee. Defense attorneys Robert Kapp and Ben Berman argued before the jury of ten women and two men that both Bill and Nancy Lee had been drinking, and that he became enraged with her when she threatened to place their baby up for adoption. PROSECUTOR WILLIAM Brokaw urged the panel to convict Boyd of first degree mur er for which the penalty was the electric chair. Kapp and Berman asked acquittal or a verdict of manslaughter which carried a sentence of one to 20 years with eligibility for parole in a year. The jury deliberated only two and a half hours March 21 before returning a verdict of manslaughter -- "unlawfully taking a life." Before reaching accord, they took several votes and requested clarification of the various possible verdicts from Judge Raymond Buzzard. Boyd was clearly pleased to escape execution. "I feel like I want to cry," he told his lawyers, smiling broadly for the first time during the trial. The jury's conclusion seemed to echo the result of the trial a year earlier when Raymond Campbell was found guilty of manslaughter for fatally shooting his wife over alleged indiscretions. (apart from Mr Waight's manuscript above) from the East Liverpool Review November 16, 1961 Story. Authorities Talk To 50 During Quiz. Sheriff Russell J. Van Fossan and police chief Americo J. Radeschi were to confer at City Hall today to map out strategy in a joint investigation of the shotgun death of Mrs. Nancy Lee Chandler Boyd, 18, of Dresden Avenue ext., whose body was found Wednesday afternoon along Beaver Creek near the Pennsylvania state line. The chief and the Sheriff directed a force of deputies and city officers who worked through the night, talking with nearly 50 persons in their efforts to piece together her movements since she left home nearly 2 weeks ago and find a motive for the brutal killing. 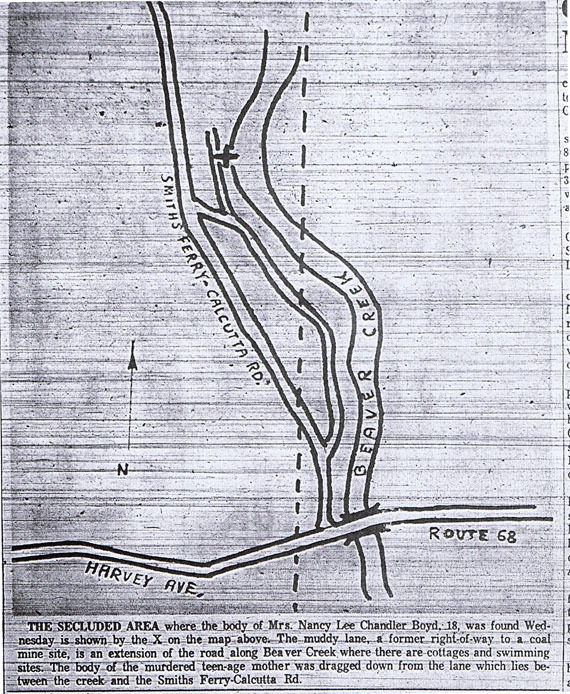 The teenage mother was discovered lying about 10 yards down hill from the roadway -- an extension of the lower Beaver Creek Road which was formally a railroad right right-of-way. Indications were that she was dragged from the roadway. Mrs. Boyd, wife of William Boyd, had been missing since November 4, and Dr. R. C. Costello, Columbiana County deputy coroner, said at the scene yesterday she appeared to have been dead over a week, a conclusion verified later in an autopsy. She was wearing slacks and a type of gold colored leather jacket which was her attire when she disappeared from her home. An Onyx ring was on a finger. Sheriff VanFossan and Chief Radeschi, working together in the probe, said the discovery of the body was first reported by telephone to city police headquarters by a man who gave his name as Roger Smith and who said he made the find while hunting in the area. The man said he had to take a woman into East Liverpool, and would return to the site to meet the officers. However, no such man arrived while the police were there. The chief appealed to the man today to come forward and aid in the investigation. The telephone call was received at 12:20 p.m. by Patrolman Paul Lemal, desk officer, the chief said. The man said he was calling from an outdoor phone booth "at the crossroads in Calcutta" -- apparently the point where the Calcutta Smiths Ferry Road intersects state Route 170. Chief Radeschi and Capt. Robert Pyle hurried to investigate in Capt. Pyle's private car after the Sheriff's office had been notified. The mysterious caller gave the department no cause for the woman's death, simply saying that he had found the body, and it was believed initially she may have been the victim of a traffic mishap or some other sort of accident, the chief said., The caller did not give his address. The body was found lying near a small tree, about 50 yards from a wide curve in the Creek. Leaves covered the wooded area, and there were large water filled depressions in the muddy road. Officers said they were black marks on the slacks, which may have been grease or some other substance, and laboratory tests were slated after the autopsy. The body was lying with head uphill and apparently had been dragged feet first down the road. Floyd Hall, uncle of the dead girl made the identification last night at the Dawson Funeral Home, but delayed telling her parents of the tragedy because both are cardiac cases and it was feared the shock might aggravate their condition. They were told after the autopsy. The dead girl's aunt Mrs. Millicent Hall, had filed the missing person report with the East Liverpool police department last Friday at 8 p. m. She said the girl had been missing since Saturday, Nov. 4, at 10 or 11 p. m. Earlier, the disappearance had been reported to the sheriff's office and other area law enforcement agencies. Dr. William Kolozsi, Columbiana county coroner, announced after the autopsy lasting over two hours that death had been instantaneous "from a shotgun blast in the left side of the head." He said the autopsy findings indicated she had been killed the night she disappeared " and at a place elsewhere from where the body was found." He said she apparently had been dragged over ground that contained coal as there were particles of coal embedded in her clothing. The place where the body was found is off an old right-of-way to a former coal mine operation and tipple. The road is considered a "lovers lane" and a resident among the few homes in the vicinity said parked couples were observed frequently. The coroner said the body was fairly well preserved despite the long exposure to the elements. The cold nights and relatively low daytime temperatures slowed decomposition. The pockets of the girl's clothing had been emptied, apparently to prevent identification, but the ring remained on her finger. In his ruling, Dr. Kolozsi termed it "homicide," and added the customary finding -- in cases of unsolved murders -- that it occurred "at the hands of a party or parties unknown." The investigating officers interviewed 45 to 50 people last night, most of them acquaintances of the girl who supply details of her background or had seen her on the streets in the last week or 10 days. Among those interviewed by the officers was the girl's estranged husband, who resides on Pennsylvania Avenue Ext. He said he saw her last on November 4 in a tavern. His wife was unaccompanied and spoke with her briefly, Boyd related. "She asked me: 'How are things going?' and I told her okay" he related. 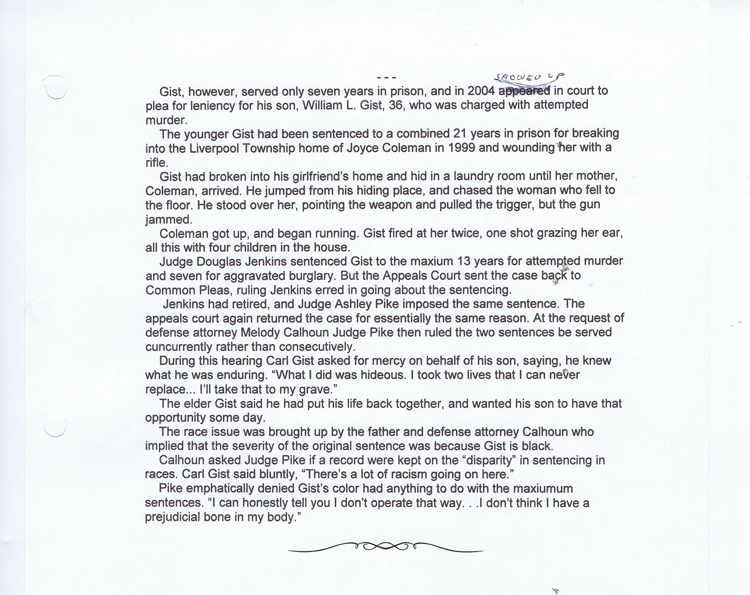 Chief Radeschi recalled an occasion about six weeks ago when Boyd was served with a warrant alleging non-support which had been issued out of juvenile court. When Boyd was notified of the charge, he replied that he had been helping support his wife and child and added: "I took a load of groceries to her this morning," the chief related. At one time in their marriage, the young couple resided on Pennsylvania Avenue, Ext. Later, they moved in with Mrs. Boyd's parents. At the time they separated, they were living in separate quarters, possibly an apartment, adjoining the Chandler home. As he prepared to confer with the Sheriff this morning, the chief said the authorities held no one as a result of the investigation last night, either as a suspect or material witness. The investigation disclosed at one time Mrs. Boyd worked at the bus terminal restaurant and the she also had taken jobs as a baby-sitter, the chief said. Hall described his niece as a "good girl" and said that when she stayed a friend's home overnight she invariably phoned her parents of her intentions. When she did not return after going out that Saturday, the family began phoning friends and acquaintances. Unsuccessful in tracing her whereabouts, they finally advised tri-state police departments about Tuesday, November 7, that she was missing. A snapshot of the girl was left with Midland and Chester police, the Hancock County Sheriff's office, the Columbiana County Sheriff's office, and East Liverpool police. The picture was taken when she was a junior high student in 1958–59. She left East Liverpool High School when she was married at 16. She became a mother when 17, and leaves 11-month-old daughter. She and her husband separated in August. Mrs. Hall said her niece left home that Saturday afternoon planning on going downtown. She was seen later in the day in a restaurant and that evening was that Higgs Inn where brother, electricians mate second class Franklin Chandler, spoke to her as she was dancing with friends. He said she was unaccompanied. The family denied she was seen as late as November 8, as had been reported. As far as has been determined, it was the last time she was seen by a person acquainted with her, the chief said. Many witnesses have been found who reported seeing her on November 4, the day she disappeared, the chief said. Despite an all out effort, it has not been determined where the girl was from the time she left the home of her uncle and aunt until the time she met her death, chief added. Apparently she vanished after leaving the tavern. Her mother returned home from city hospital November 5 after treatment for her heart condition and the girl at visited her daily the preceding week, the family said. Her brother returned to the San Diego Navy base class Monday after a 30-day leave it home. Mrs. Boyd was born in East Liverpool April 11, 1943, two Frank E. Chandler and Alice Tasker Chandler and attended the first church of the Nazarene. Besides her parents, she leaves her husband of East Liverpool; the daughter, Tania Lou Boyd at home, and a brother with the Navy. Services will be held Friday at 2 p. m. At the Dawson funeral home by the Rev. James Hunton. Burial will be in Columbiana County Memorial Park. 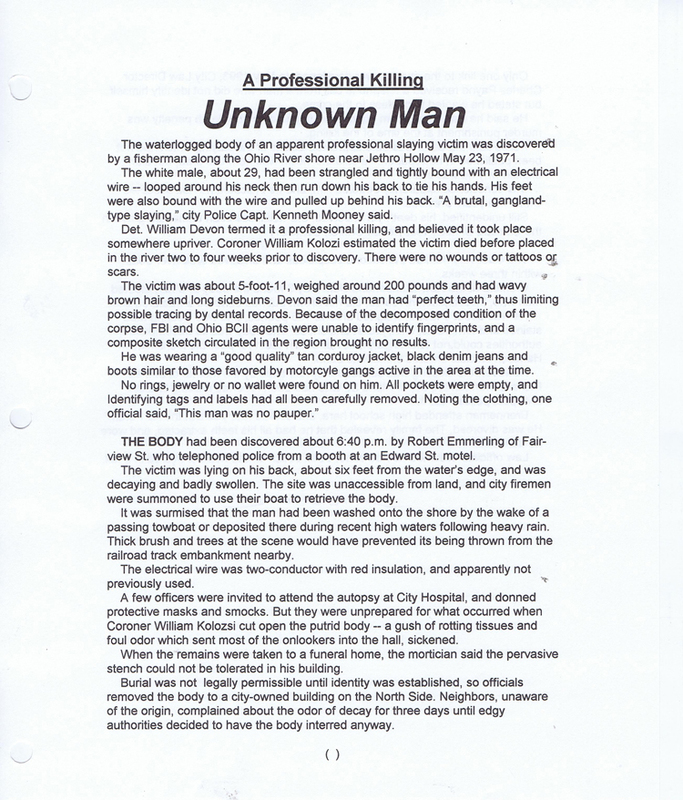 Three men were eventually captured, tried and convicted of the 1972 murder- robbery of a city auto parts dealer and coin collector in his downtown East Liverpool apartment. 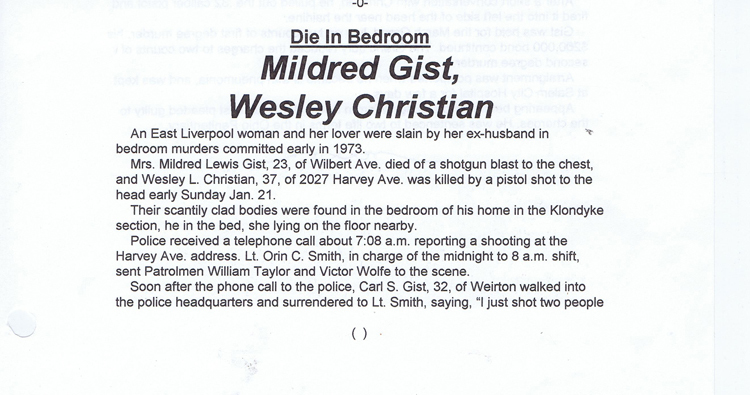 Willis Smith, 55, was found lying in the kitchen of the second floor quarters over his business at Broadway and Fourth St., shot three times with a German World War II pistol. Around 8:28 am. on Monday, Nov. 13, police received a telephone call from person in the neighborhood reporting unusual noises and a gunshot somewhere in the area around 6:45. Patrolmen William Talbott and Ron Roach went to the site, and checked doors of several buildings. Finding the Smith entryway door ajar, they went up the stairs and discovered Smith lying face down on the kitchen floor of the lavish apartment, partly under a breakfast bar. He was wearing a red bathrobe and shorts, his feet bound with his own shoelaces. A belt, found nearby, had apparently been used to secure his hands. Officers believed he had been seated but not tied to a chair, and managed to work loose from the belt. He probably surprised the robbers who then fired a hail of bullets. 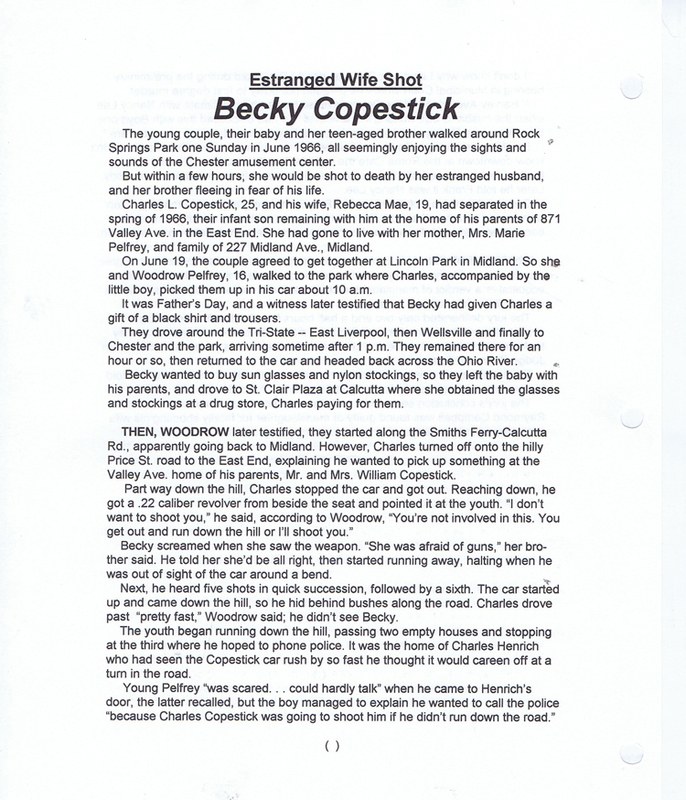 He had been shot under one eye and through the upper left arm. INVESTIGATION REVEALED two men were seen leaving the vicinity about the time the unusual noises were heard by the phone caller. The door of a safe was open, contents of its drawers scattered. A later check showed the loss less than first estimated. Part of a coin collection was taken, but friends said Smith kept only coins worth $1,500 to $2,000 in the home, his more valuable items stored in bank safety deposit boxes. The victim's own gun was lying near the body, loaded but on safety and unfired. It had been given him only a few weeks before by one of his sons. An autopsy revealed the shots had been fired from above the victim, two hitting him in each arm, coursing downward causing hemorrhaging in the lung area and death. Coroner William Kolozsi said Smith literally strangled in his own blood. The bullet under the eye could have been fatal, smashing through the cheek bone and into the head. The Coroner said the victim might have lived eight minutes afterward, but would have been unable to seek help because of the severe wounds. Police found a total of eight spent cartridges, either 9 mm or 7.65 mm of the type used in German P38 models. Smith, who lived alone, owned and operated the Smith Auto Parts at 329 Broadway for 27 years. It was an isolated corner building which was originally the Potters National Bank. Few homes are near -- the former high school, Carnegie Library and parking lots are opposite. 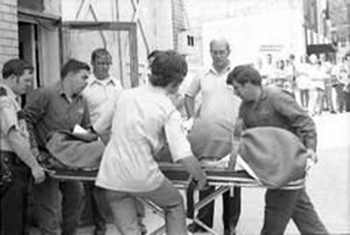 He was survived by his widow, a daughter and two sons. The slaying remained unsolved for some two years until a Pennsylvania man was arrested at Midland, Texas, for theft of a car in Las Vegas, Nevada. Frank Ringler, 50, of McKeesport, Pa., was returned to Las Vegas, and under questioning by police there said he had knowledge of a murder and coin theft in East Liverpool. 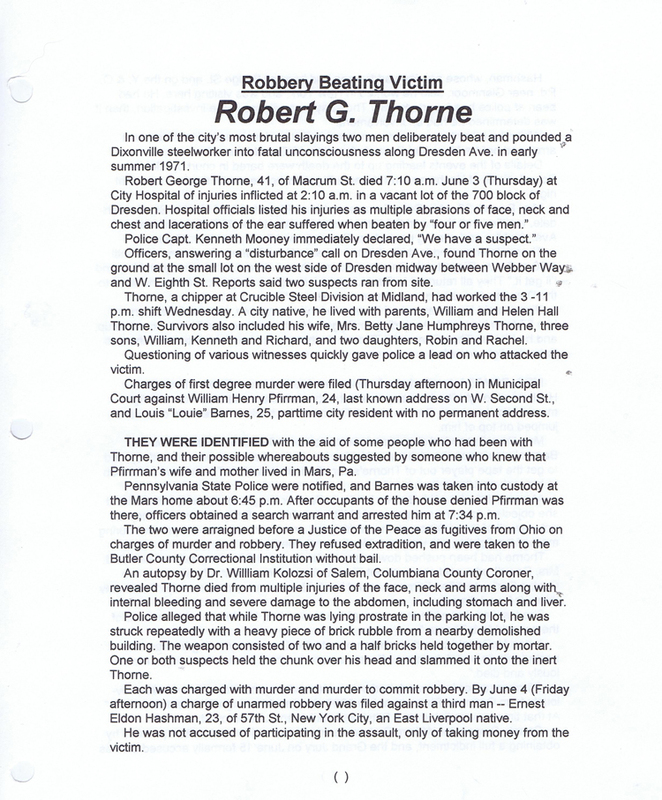 He provided the names of Charles Breon and Joseph Crane in connection with the crime. Nevada police notified the Federal Bureau of Investigation which relayed the report to city officers. This was the first solid clue, and the case was turned over to Det. William Devon, because the original investigation was directed by Det. Capt. Kenneth Mooney, since promoted to Police Chief. Breon, 26, of Milroy, Pa., reportedly had been in the apartment with Crane, 45, of Philadelphia who fired the fatal shots. Ringler claimed he waited outside in a car. He said he first heard of Smith's coin collection from a chance acquaintance when he stopped in East Liverpool on his way to Pittsburgh from Cleveland on a bus. Ringler told police he contacted Breon who got in touch with Crane, a helper for a brother who was a plumber in Philadelphia. The three men had known each other as fellow prisoners. Ringler denied he knew about the shooting until the other two men came back to the car. 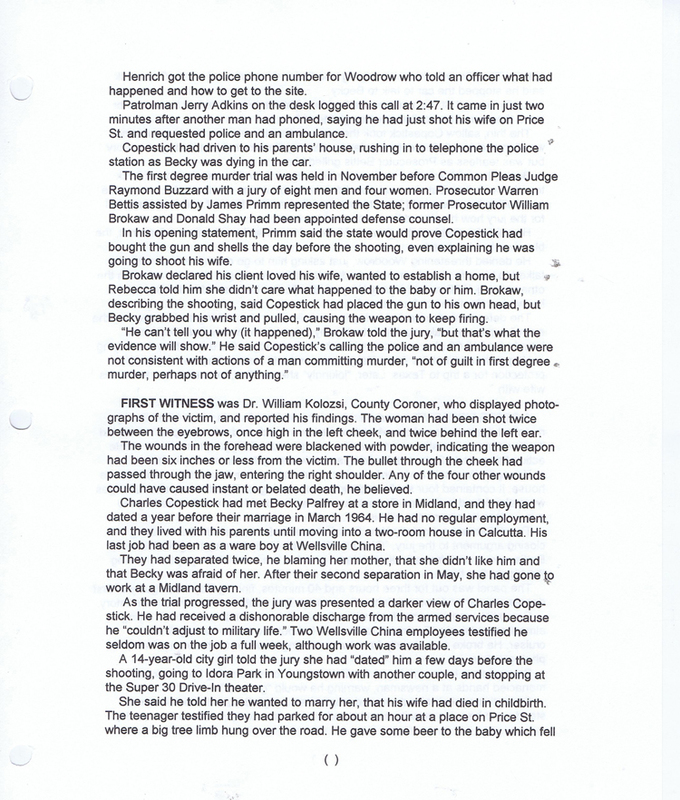 Eventually all three men were brought to Columbiana County under indictment -Crane for aggravated murder. Crane went on trial in October 1975, but a jury of nine men and three women could not reach a verdict after ten hours of deliberation, and Judge Warren Bettis ruled a mistrial. BREON HAD pleaded guilty to armed robbery, and was sentenced to four to 25 years. 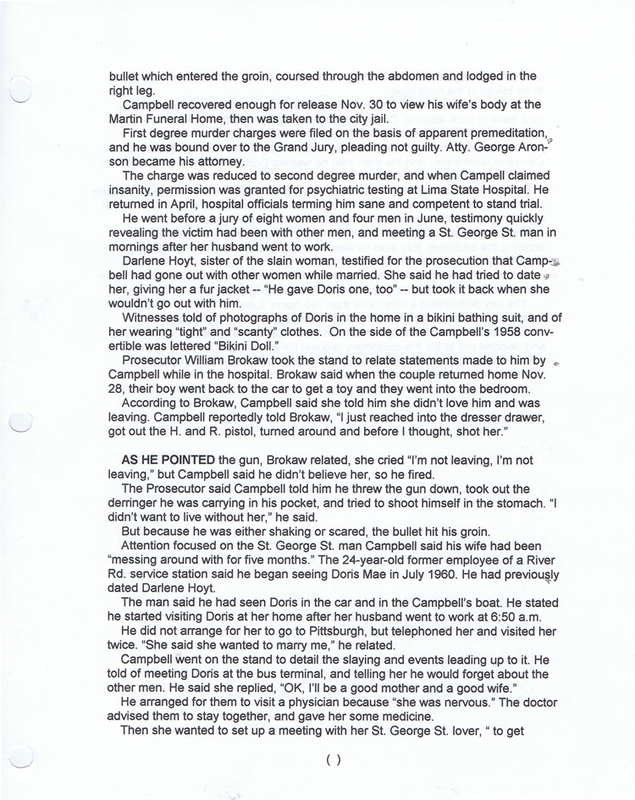 Transfer to prison was delayed so he could testify at Crane's trial. 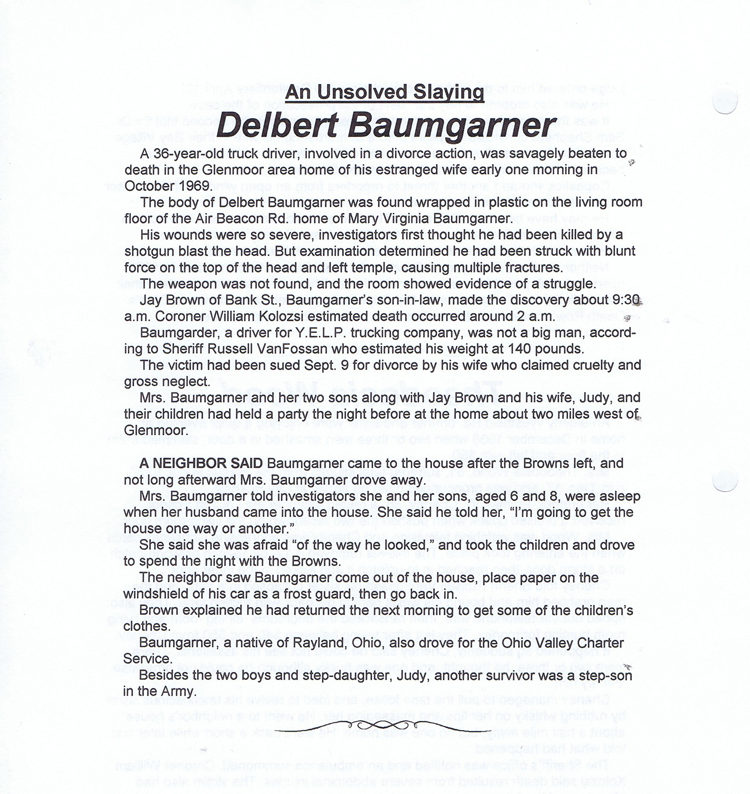 Ringler, held in the Southern Ohio Correctional Institution at Lucasville for unarmed robbery, was brought to the county as a state witness. Crane's second trial began Nov. 17, 1975, with Prosecutor Joseph Baronzzi and David Buzzard, chief assistant, representing the State, and Attorneys Lawrence Stacey and Douglas Jenkins appointed Crane's counsel. The first prosecution witnesses were Linda Mattern and Patricia Boyd who said they were parked on the old Central School lot and heard what they said sounded like pounding. Later they saw two men cross Broadway and Fourth St. and walk along the north side toward the Salvation Army building. One was carrying a suitcase with a floral design, the other held something in his arms. On the stand again, Breon testified he and Crane went to the Smith apartment on the pretense of wanting to look at some coins. When they made themselves known at the door, Smith spoke over an intercom, and unlocked the door. The pair entered and climbed the stairs, Crane in front. Smith led them to the kitchen area, and told them to have a seat, Breon testified. Crane then pulled out his gun and said, "No, you sit down." Then Smith was forced into an adjoining bedroom, and bound with various materials found in the apartment. But the victim started to shake, and explained he needed his medication and a glass of water. Breon said he got a butcher knife from the kitchen and cut the bindings, taking Smith to the kitchen where he obtained the medicine. Then Smith was placed on a kitchen stool, and Crane demanded to know the combination of the safe. The safe didn't open on the first try, but Crane was successful on the next. Breon said he was looking out a living room window to see if anyone had observed them come in when he heard several shots. Frightened, he ran down the stairway to the landing when Crane called, "Get back up here!" He turned around to see Crane pointing his gun at him, so he went back upstairs where Crane told him to find some suitcases. The two packed some coins in a suitcase, and then hurried back to the parked auto. The trio drove to Breon's home at Miliroy near State College, arriving the next morning after getting lost for a while in Pittsburgh. Breon said he went to work that same day, but Crane and Ringler traveled on to Philadelphia. Crane "fenced" the coins there, and they met later to spliothe profit from which Breon said he got about $200. Crane did not take the stand. The defense case rested on the deposition of a retired probation officer and two relatives. Crane's brother-in-law recalled Crane had visited him the night of the murder and watched television -- "The Tom Jones Show" and "The FBI." His brother, Harry Crane, a Philadelphia plumber, said Joe had worked for him Nov. 13-14. The jury deliberated seven hours in bringing in a verdict of guilty. Crane was sentenced to life in prison. In 1983, while in Hocking County Prison, Crane was denied by Judge David Tobin a motion to set aside his conviction. The prisoner claimed he had been indicted for first degree murder, but was found guilty of felony murder. Tobin ruled that Crane had competent legal counsel, and questions about the indictment should have been raised when Crane's original appeal was filed in 1976. A Chicago woman, looking for antiques, walked into a Dresden Ave. furniture store late in July 1973, and came upon two badly beaten bodies and a severely injured child. She had stumbled upon one of the city's worst murder cases -- a horrendous crime which remains unsolved today. Dead were Earl A. Tweed, 75, store owner, and Mrs. Arthur (Linda) Morris, 22, who was four months pregnant. Her daughter, Angela Lynn, 4, was battered and unconscious, dying shortly afterward. Tweed of 3rd St. had operated the National Furniture and Upholstery Repair Co. since 1912 when he came to the city from Steubenville. 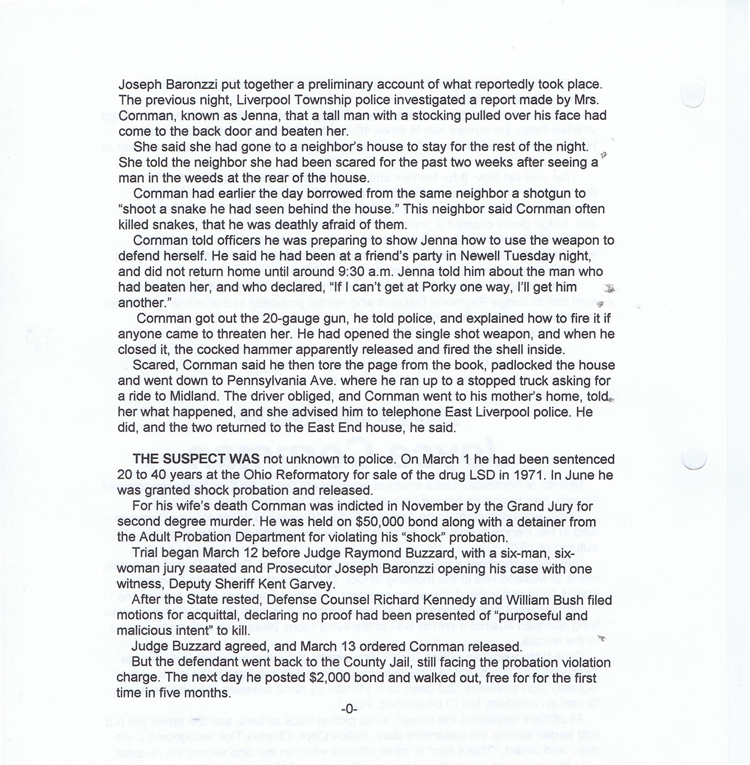 Police surmised Mrs. Morris went into the shop and came upon a robbery in progress. Mrs. Frances Dugan of Chicago, a nurse, walked into the store just before 1 p.m. July 30 -- a Monday -- planning to inquire about antiques. Discovering the bloody scene, she ran outside and shouted to someone across the street, "Call the police! Something terrible has happened!" A telephone call was received at police headquarters within minutes. 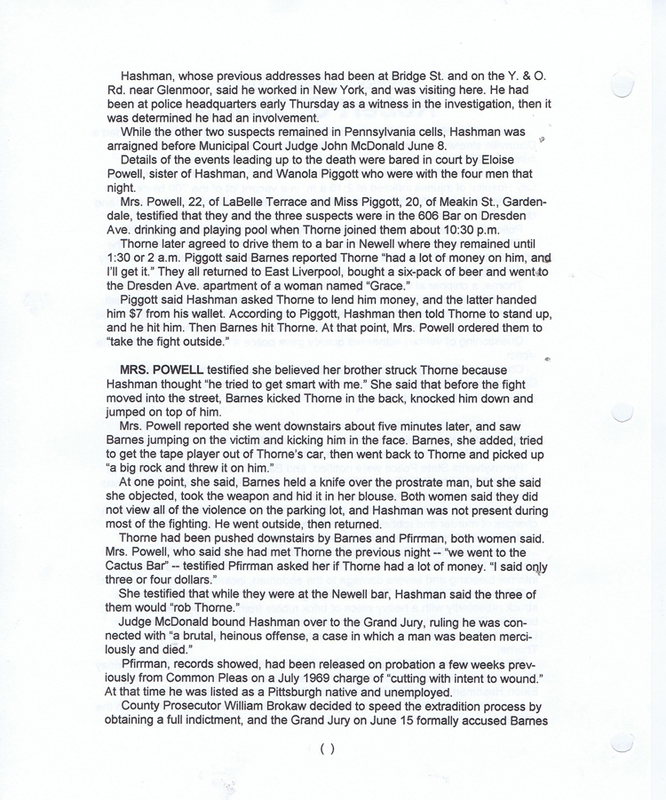 Since Tweed was lying several feet away from the woman and her daughter, he was not seen immediately by first arrivals, so the phone call reported only two victims. Dresden Ave. was a busy thoroughfare leading northwest from the Diamond to the Route 11 Freeway north to Youngstown and Route 7 south along the Ohio River. MRS. MORRIS HAD apparently gone to the store to talk with Tweed about renting a house. She was wearing a blue tee shirt and checked pants. Her purse lay in a smear of blood. Her body was about 30 feet from the entrance of the store which was crowded with furniture and antiques. A narrow aisle led to an office at the rear. She was on a mattress that had apparently fallen from a leaning position. The little girl lay nearby. Tweed, attired in dark trousers, dark shirt and dark shoes, was found down a dim aisle leading to an open space and washroom. The body lay about four feet from the basement stairway. He had been stabbed and beaten. On a chair were pieces of meat and bread which Tweed may have been preparing for his lunch. Amid blood on the floor were a serrated steak knife, a wrench and a claw hammer. Police said the knife was used to stab Tweed 21 to 28 times in the chest. Later in the afternoon, a telephone call to police reported papers strewn on outdoor steps and along the Freeway fence a block from the furniture store. Patrolman Jim Buckley went to the site, finding papers of Tweed's along with his wallet which contained no money. The killer, rushing from the store, had bumped into a young boy whom he grabbed, demanding to know where he lived. The boy wouldn't or couldn't answer, and the man ordered him to tell -- "or I'll kill you!" The youth twisted loose and raced from the area. It was believed the man then ran through a vacant lot adjacent to the store toward the Freeway and the steps where Tweed's items were found. Both Mrs. Morris, a native of Alliance who resided at Salineville at one time, and her daughter had severe bruises and multiple lacerations. 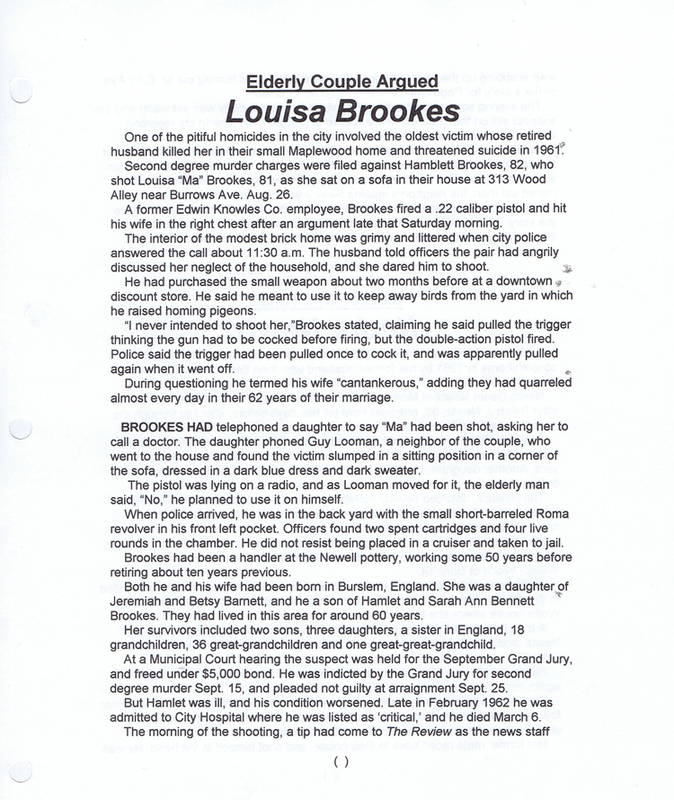 The husband and father, Arthur Louis "Louie" Morris, had started work with the city street crew the previous month. Morris was told of the deaths and taken to City Hospital by Mayor Norman Bucher and others. 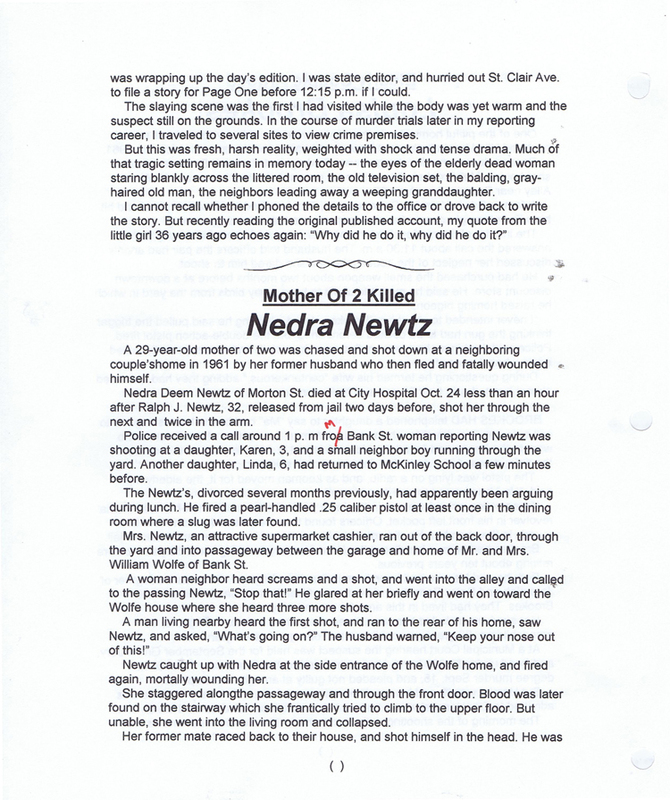 The dead woman's mother-in-law, Mrs. Lettie Morris, learned of the tragedy while shopping downtown, and hurried to the store, knowing Linda was to visit Tweed. When police described Linda's clothing, Mrs. Morris burst into tears. Mrs. Dugan had remained at the store's entry until police arrived. Her husband, Daniel, stayed in their car because of a leg problem. A man residing in a bungalow owned by Tweed at the rear of the two-story brick building said he heard nothing during the lunch hour, and saw no one leave through the basement door which apparently had not been opened for some time. A high window at the rear of the store was open, but was kept that way during hot weather. Tweed had been a member of the First United Methodist Church for 37 years, belonged to its choir and a men's Sunday School class. He earned honors in the Eagles Lodge, and belonged to Masonic orders and the Moose lodge. Survivors included his wife and a daughter. Detective William Devon headed the original investigation since Det. Capt. Kenneth Mooney was on vacation. Working with Devon were Chief Americo Radeschi, Detectives Kenneth Montgomery and Charles Coen and the rest of the force. THE COLUMBIANA County Sheriff and Prosecutor assisted, along with four men from the Ohio Bureau of Criminal Investigation. The BCI agents conducted a thorough search of the store and Dresden Ave., collecting more than two dozen items which were checked for fingerprints, blood analysis, hair evidence and other clues. A rough description of the slayer was circulated across the region. Members of the detective department flew to an Ohio city to quiz a suspect charged in another case and who fit the description. The trip was fruitless. The Fraternal Order of Police of East Liverpool and Wellsville jointly offered a $500 reward. It has never been collected. But the case is still open. 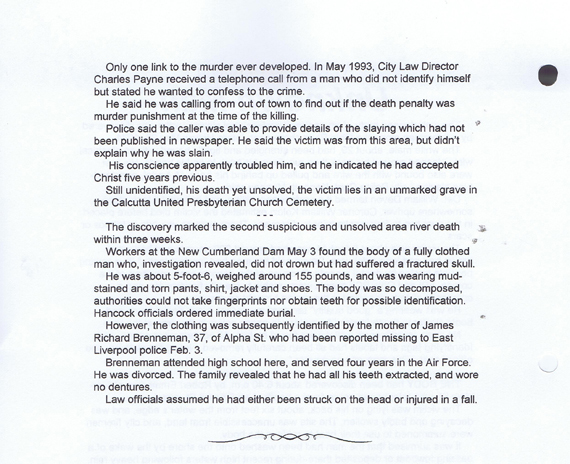 Officers who checked out leads during the 25 years since, continue to hope that some day the killer will let slip a wrong word or finally confess or be connected to evidence bringing him to justice.